Electronics guru James Demeter has spent more than three decades producing amps and pedals that exemplify his no-frills approach to handcrafted analog gear. Based on his 800-watt VTBP-M-800D bass amp, the new Bass 400 is a petite 400-watt powerhouse that pairs Demeter’s early ’80s VTBP-201 tube preamp with a class-D power amplifier. The idea was to provide a smaller and more affordable alternative to Demeter’s flagship bass amp, with minimal tonal sacrifices. Half-Power Howler The Bass 400 comes in two aesthetic flavor options—a caged enclosure (which we received for our test unit) or a tolex-wrapped head. An exceptional handwiring job was revealed when I pulled the amp’s bottom panel off. The preamp’s circuit board looks decidedly old-school next to the modern and precise class-D power-amp board. The preamp’s board is populated with low-noise metal-film resistors and a ceramic socket for the 12AX7 tube. There’s also a little trimmer pot for matching the amp’s output volume with the sensitivity of your bass’ pickups. The front panel sports a 3-band EQ and controls for volume and presence, along with separate inputs for active and passive basses. A switch below the bass dial sets its range to within either 60 Hz or 120 Hz, and the switch beneath the treble knob selects dark, normal, or bright mode for the highs. Pros: Jaw-dropping fidelity across the board. Smooth, versatile tones with loads of headroom. Robust build. Cons: Fast attack might frustrate those looking for less-intense tones. Pricey. Pros: Delivers balanced tones with superb note separation. Includes handy tweeter attenuator. Handles loud volumes well. Cons: Bulky and on the heavier side for a 3x10 cab. The back of the amp features separate power amp in and preamp out jacks alongside dual Speakon 1/4" combo speaker jacks, which deliver either 250 watts into 8 ohms or 400 watts into 4 ohms. The rear panel also houses a balanced XLR output with a pre/post EQ switch that can be upgraded with a dedicated Jensen transformer for a couple hundred bucks. The Bass 400 is voiced for the BSC-310 speaker cabinet that Demeter also supplied for the review. The 50-pound cab is loaded with a trio of custom Eminence 10" drivers and a center-mounted tweeter, and can handle up to 450 watts. The tweeter has an adjustable volume control that’s located on the cab’s rear jack panel. The BSC-310 is constructed from marine-grade birch plywood and is a stalwart little cab, albeit a bit bulky to lug around and a little on the hefty side for its configuration. Big ’n’ Tasty With the Bass 400’s EQ set flat and a trusty Fender Jazz plugged into the passive input, the amp unleashed a warm and lush midrange with thumpy lows and a quick attack. It was also surprisingly transparent. (I’m talking about a level that’s normally found with amps that use much larger output transformers.) The class-D power amp delivered big headroom and the amp had a seemingly magical ability to translate every nuance of my fingerpicking. The fast note delivery and squeaky edginess of the high end helped make a great foundation for old-school prog-rock riffing à la John Wetton-era King Crimson, especially when I turned up the middle dial to around 2 o’clock for some additional midrange grind. I’ve personally never been a huge fan of preset high-end roll-off modes. I often find them limiting, which is why I typically opt for an external parametric EQ. That said, I was really pleased with how well the amp’s bright and dark modes either accentuated or curbed the overtones. The dark mode pulled just enough of the edge off without sacrificing the midrange’s punchiness and articulation, and its additional low-end spread gave soulful R&B work the extra thump it typically calls for. I had a blast using this mode to throw down my favorite James Alexander licks, though I really would have liked a preamp-gain control to try to coax a gooier tone by slowing down the amp’s breakneck attack. On the opposite end of the spectrum, the springy sounding bright mode is a slapper’s dream. The highs were especially vibrant and clear, and even light hammer-ons and trills helped the notes leap off the fretboard with ease. When I relied solely on using my onboard volume and tone knobs for tonal changes, I found the bright mode to be tremendously versatile for rock, funk, metal, and blues. It was easily my favorite mode of the three. After some time with the rig, I began to wonder how much of a factor the BSC-310 cabinet played in my tonal brew. That was quickly answered when I paired the Bass 400 with an Ampeg SVT 4x10 to A/B, and quickly determined that the BSC-310 delivered more projection and fullness. 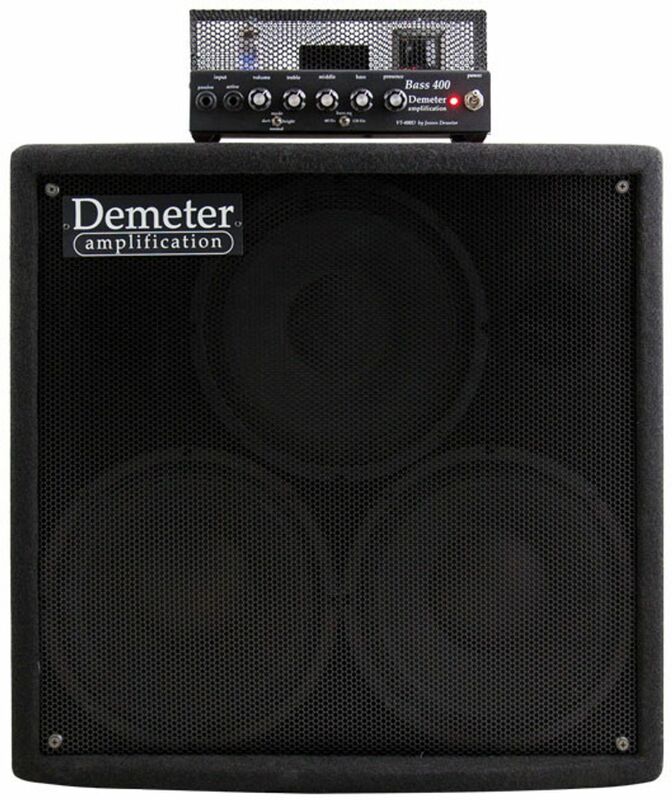 Yes, the Ampeg cab still sounded great and delivered a solid tone at both high and low volumes, but it didn’t match the Demeter cab’s midrange articulation and low-end depth. The Verdict Demeter was smart to exploit the strengths of their tube preamp and pair it with a class-D power amp for the Bass 400. The efficiency of the power amp lends a lot of fidelity to the velvety smooth-sounding preamp, which yields a palette of tones that aren’t quite those found within a full-blown tube amp, but are undeniably more natural and responsive than what you’ll get from a solid-state head. The Bass 400 might not have some of the qualities of a pushed tube amp, such as a molasses-slow attack, but when tube traits are stacked up against the Bass 400’s strengths—which there are a lot of—it’s a very minor quibble. This rig delivers.